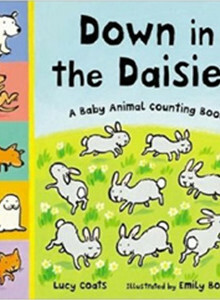 A first counting book in rhyme, which takes in weather and different baby animals all around the world. See how the bunnies hop hop hop, and the tadpoles wriggle squiggle! I dedicated this book to my dad, because he was the one who really taught me to look at stuff and notice things. He taught me how to spot birds hiding in trees and hedges, how to see that the brown blob in a field was really a hare crouching in her form. We once spent a whole afternoon watching a dormouse in an elderbush. We looked at clouds together and named them—great rolling names like altocumulus undulatus, nimbostratus, fractostratus and the wispy cirrus that streams across the sky in white mares’ tails when it’s windy. He taught me weather lore like ‘red sky at night, shepherd’s delight, red sky in the morning, shepherd’s warning’, and the fact that the leaves on some trees will turn up their undersides if it’s going to rain. He was very fond of rhymes like “mares’ tails and mackerel scales make tall ships carry low sails,” as well as “when the wind is in the east, ‘tis neither good for man nor beast.” When he quoted that one, I knew to stay out of the way, because he’d generally be in a bad mood. Now I am passing all this stuff on to my own children so that it is not lost. And yes, I always feel grouchy when the wind is in the east. I wanted to write a fun counting book that also helped very young children to look at the world around them and notice things. So I put in animals from different countries—mothers and babies—so that kids could learn the names. And I put in climates and weather too. So many kids live in cities and towns and aren’t as lucky as I was. I wanted to help them learn that there are things to look at wherever you live—birds still nest and sing in parks and gardens and on windowledges above buildings; foxes run about urban areas; mice live behind your skirting boards. And clouds and weather are everywhere—you just have to look up. It’s all about really using your eyes to see what’s all around you. Sadly this book is now out-of-print, but you can still find it at secondhand bookstores and online at AbeBooks.